With Ntel, you get a whopping 12GB for just N1000. Though you can’t view your balance since their site is still on maintenance, you can activate a data plan by walking into any Ntel store close to you. 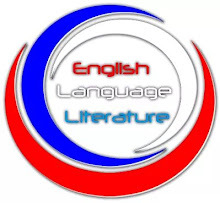 Its customer care is always ready to attend to your request(s) or complaint(s). Presently, Ntel is faster than before; it doesn’t buffer when you stream with it. As a result, I advise you get a Ntel SIM card if you are in a state with Ntel network. Inarguably, Glo is still the grandmaster of data, and if your Glo SIM card has been swept under your carpet due to its frustrating network signal, it is time to take it up because Glo is currently dishing out 2.4GB for N500 to abandoned old Glo SIM cards and new Glo SIM cards. Don't be scared, its browsing network is now stable in most locations. Just give it a try! 1. 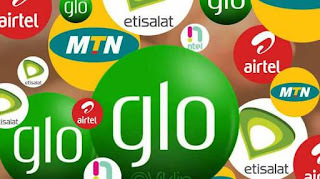 You must purchase a new Glo SIM card, or must have an old Glo SIM card which you haven't subscribed for the past 90 days. 2. You must Migrate to Glo Yakata tariff plan by dialing *220#. 1. Having migrated to Glo Yakata tariff plan, dial *100# to verify your tariff plan. 2. Recharge your line with N500 only, and you will be given free 600MB (Glo Yakata Bonus) + 1750 airtime to call all networks. Check your data balance by dialing *220*1#. 3. Since your N500 is still intact in the main account, dial *777# and select a data bundle of N500. This gives a whooping 1.8GB. Glo OgaSim gives you 125% bonus data whenever you recharge your line before your current plan expires. For instance, when you recharge with N1000, you get 4.8GB. N2500 gives you 14.4GB, with 30 days validity period. You can always top up or roll over. Glo Special Data Offer gives you a whopping 1.2GB for N200. The data is valid for 3 days. Click here to see how to subscribe for glo special data offer. This amazing offer has been blazing since 2017, but only a selected few are enjoying it. Airtel Triple data offer rewards you with 3x the amount of data that you purchase. For instance, if you purchase a data bundle of N500, which gives you 750MB, you will get 2.2GB. That is three times of the 750MB that you purchased. The same goes for other plans, but as usual, not all Airtel SIM cards are eligible for this offer. 2. If you receive a message like the one above, continue with the next step. But if you don't, it means that you are not eligible for the offer. 3. Send MIFI to 141. 4. After that, recharge your SIM card with either N500 or N1000 airtime. You can also recharge with N2000 airtime if you like using the normal code: *126*rechargepin#. 5. If the recharge is successful, simply purchase any data plan that the airtime can afford, and you will get 3x the data volume purchased. 6. To check your data balance, simply dial *223#. 1. Recharge N1000 and get 4.5GB data (1.5GB android data + 3GB YouTube streaming). 2. Recharge N2000 and get 9.5GB data (3.5GB android data + 6GB YouTube streaming). 3. Recharge N2500 and get 15GB data (5GB android data + 10GB YouTube streaming). 4. 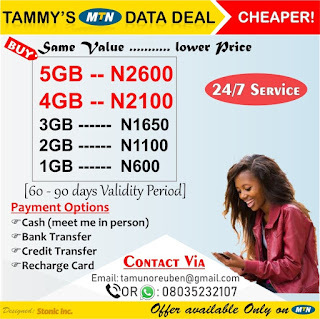 Recharge N3500 and get 17 GB data (7GB android data + 10 GB YouTube streaming). 5. Recharge N4000 and get 19GB data (9GB android data + 10GB YouTube streaming). Each of these data plans has a 30-day validity period, and the YouTube free data is usable only at night. If you are interested in any of the aforementioned Airtel Data Plans for YouTube streaming, dial *323# and follow the prompt to subscribe. MTN just launched cheap data plans which, in my opinion, is one of the cheapest data plans. 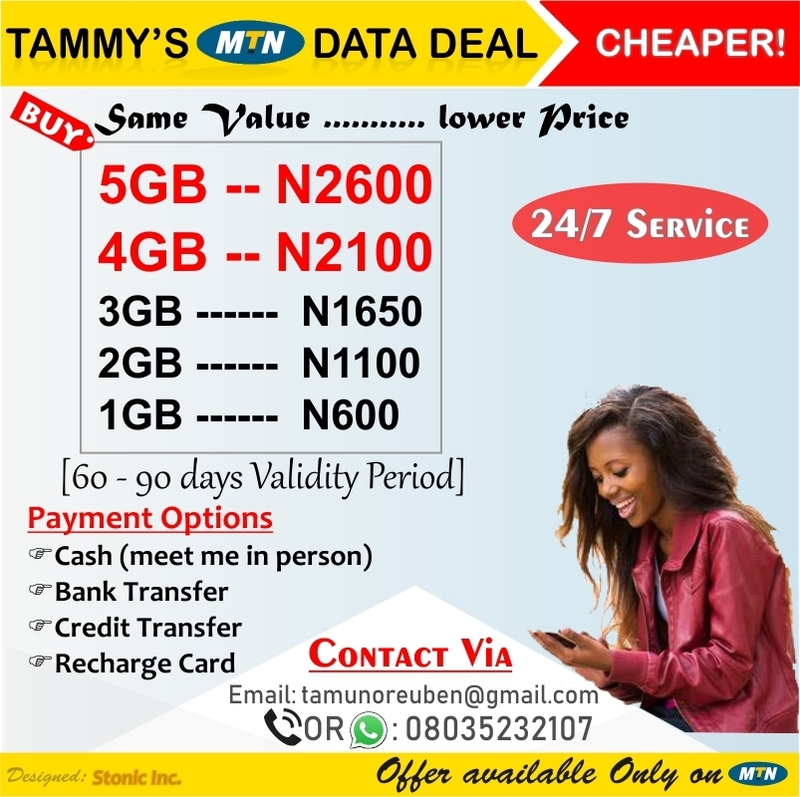 You can get 1GB for N200 (valid for 7 days), 4GB for N1000 (valid for 30 days) or 250MB for N100 (valid for 3 days). Please, note that this data package is not for every MTN user. You must be very lucky to have it activated on your SIM card. Dial *131*65# to subscribe and *131*4# to check your data balance. 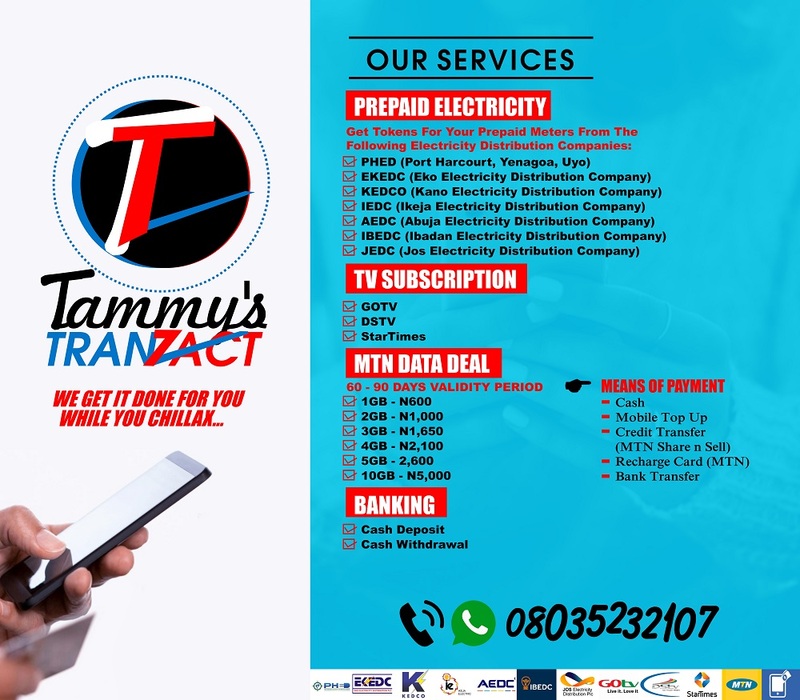 Should you see anyone that is within your budget, kindly call/whatsapp Tammy on 08035232107. For more information, check the image below. Nothing has changed as regards 9mobile data plans/bundles. We just hope its new owner(s) will dish out something irresistible soon.